The behind-the-scenes organizers of an exclusive Democratic donor confab over the weekend were a fundraising consultant who has made a windfall from big-money political fundraising and a public affairs firm that works to get money out of politics, documents show. 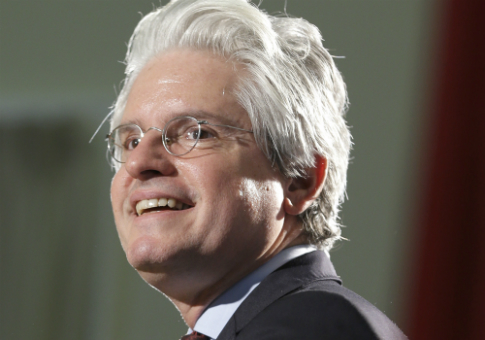 David Brock was the public face of the event, held over the weekend at the ritzy Turnberry Isle Resort in Aventura, Fla. However, documents obtained by the Washington Free Beacon show that nearly all logistics were handled by two Democratic consultancies: the Bonner Group, a fundraising firm, and Civitas Public Affairs, a left-wing strategy and public relations shop. Mary Pat Bonner, president of the Bonner Group, is a longtime fundraiser for Brock and his network of political groups, which donors gathered in Florida to finance. Her work for the groups in Brock's network has allowed her to take large fees off the top as money is passed between groups. Civitas Public Affairs, meanwhile, has been deeply involved in an effort by liberal billionaire George Soros' political network to diminish the influence of big-money donors. The contrast between the two groups, and their collaboration in the weekend's conference, illustrate a central disconnect of the event: Ultra-wealthy donors had gathered to figure out what went wrong in a presidential election that was, in part, a rejection of the political elite. If Civitas and the Bonner Group differ in ideology, there was no sign of it at the weekend conference. Documents on file with the Turnberry Isle resort show that staffers from the two groups, including Mary Pat Bonner and Civitas founding partner Bill Smith, were the point people for nearly all logistical matters. At 10 a.m on Thursday, hours before donors arrived at the conference, its organizers held a planning meeting at the private dining room of Bourbon Steak, the hotel's on-site steakhouse, where diners can wash down $295 per ounce Tsar Imperial caviar with a $7,200 bottle of Krug Clos d'Ambonnay champagne. Four staffers each from Civitas and the Bonner Group were in attendance to discuss the weekend's events, according to hotel documents. Two nights later, the conference held an evening reception at Bourbon Steak, renting out the whole restaurant and bringing in a live band. The hotel expected the group to spend "$60,000++" on the evening's festivities. That bill, and other expenses for the conference, would be sent directly to Civitas and Bill Smith, listed on hotel documents as the designated invoice recipient. Smith, Bonner, and Bonner Group senior account executive Bill Thau were the only organizers authorized to charge the "master account(s)" for the weekend. Smith also served as the primary point of contact for logistical issues throughout the conference, along with Civitas operations and special projects director Caleb Queen, identified elsewhere in hotel documents as the "key group contact." Civitas has worked for a number of prominent liberal and Democratic organizations, including EMILY's List Super PAC Women Vote and the Brady Campaign, a leading gun control group. It also has done work for a green energy-focused political group called Citizens for Responsible Energy Solutions, which has listed its mailing address on tax forms as the same Washington, D.C. building that houses Media Matters, American Bridge, and other arms of Brock’s political network. However, publicly available documentation does not show any direct work Civitas has done on behalf of the Brock network (nonprofit tax filings for 2016 that might show such a connection are still months from being publicly available). The Bonner Group, on the other hand, has been deeply involved in soliciting money for the Brock network. Bonner has fundraised for Brock-backed groups, including the short-lived Fund for America in 2007 and the super PAC Correct the Record in 2016, which blazed new and controversial trails in big-money politicking. Consistent with Brock's constellation of groups, ranging from 501(c)(3) and (c)(4) "dark money" nonprofits to political action committees and super PACs, the Bonner Group has long blended explicitly political work with ostensibly nonpartisan, tax-exempt "educational" and "social welfare" advocacy. As early as 2007, the firm was devising plans for the groups in Brock's orbit to use money solicited from wealthy Democratic donors to operate parallel, but ostensibly independent, political and policy efforts. For her work on Brock's behalf, and on behalf of other high-profile Democratic clients, Bonner and her firm generally pocket 12.5 percent of money raised. But Brock's various groups also pass money among themselves. Public records show that the Bonner Group takes a commission from those transfers as well. This arrangement allows the Bonner Group to take multiple commissions on the same pool of donor money. "The Bonner Group gets us the best fund-raising product for the lowest cost," Brock told the New York Times in 2015. "In my experience, the commission incentivizes the fund-raiser to meet the ambitious goals we set." However, it also confers immense power on Bonner, whose Rolodex of donors makes her a hot commodity in increasingly expensive elections and policy advocacy activities. "With each party more reliant than ever on networks of outside groups to supplement its advertising and opposition research, fund-raisers like Ms. Bonner hold the keys to the big-money kingdom," Times reporter Nick Confessore wrote. As Bonner has made a windfall from campaign finance laws that encourage high-dollar fundraising, Civitas has worked for restrictions on political giving. According to hacked internal documents from billionaire George Soros' Open Society Foundations, Civitas was the lead organizer behind an effort called Victory 2021 that aimed to reform campaign finance laws to reduce the influence of high-dollar donors. "The Victory 2021 plan is administered by Civitas Public Affairs," one document noted. Another described Victory 2021 as "a multi-organization campaign, coordinated by Civitas Public Affairs, that aims to reduce the influence of money in politics by 2021." That mission is a stark contrast to the Bonner Group's business model and to the character of an event that assembled wealthy individuals to plot strategy behind closed doors, prohibiting the few credentialed reporters in attendance from even speaking with the assembled political moneymen. Brock's speech at the event embodied some of the tensions inherent in his fundraising efforts. Brock blamed "Jim Comey and the Clinton-hating traitors at the FBI," "the Russians," "union-busting" in Michigan and Wisconsin, "fake news," and even the Clinton campaign itself for failing to heed his political advice. At no point did Brock suggest that voters had rejected the type of gathering he had just assembled. It was that type of introspection that Jeff Weaver, the campaign manager for Clinton primary rival Bernie Sanders, urged after Clinton's general election loss. "Hopefully, the Democratic Party re-establishes faith with the American working class in every zip code by authentically offering a bold and positive vision—a vision with no room for the ineffective gutter politics that benefit Mr. Brock and his friends," Weaver wrote after the election. But as millions of grassroots Democrats took to the streets to protest Trump on Saturday, six of the seven candidates to lead the Democratic Party had decided to attend Brock's donor retreat instead. UPDATE 12:10 P.M.: A previous version of this story stated that Citizens for Responsible Energy Solutions was headquartered at the same address as Media Matters and American Bridge. The group has listed that address on tax forms, but has never maintained a physical office there. This entry was posted in Politics and tagged David Brock, Democratic Party, Super PACs. Bookmark the permalink.